Cyren is an anomaly of a character, which has to say something in a city full of strange and weird people, places, and things. She is an innocent teen girl with enough firepower to wreak havoc on half the city. Her brain is split between artificial development and biological growth, being fearless and highly capable in combat and paradoxically unaware of her own strength and functions. If put into a life threatening situation, often her subconscious mind will access computer systems she didn’t know existed. She often is surprised by what she can do and is far more powerful than she lets on only because she is blissfully unaware of it herself. Despite her less than savory origins, she fights on the side of justice alongside her best friend Borealis, constantly saving the day with her unique brand of positive enthusiasm even in the direst of situations. Cyren’s body mimics a human’s with exterior armor plating is composed of lightweight microlattice metallic “skin” her interior is composed of carbon nanofiber “muscles” grafted onto a magnesium alloy endoskeleton, making her body both durable and lightweight. Her partially robotic brain helps calculate precision movements to predict and counteract enemy movements as long as her body and organic side of her brain can keep up. She attacks enemies with distorting physical attacks powered by what she calls her “sonic drive” to overwhelm her foe’s senses. Key points of her body contain micro sonic emitters she uses for close range sonic attacks and powerfully disorienting body blows. In a pinch, she can focus the emitters of her body into a frontal sonic blast that decimates those caught in the blast and disorients those around her. Despite her many run-ins with the unsavory villains of San Cielo, Cyren is an innocent, almost criminally oblivious, happy-go-lucky super hero who revels in attention. 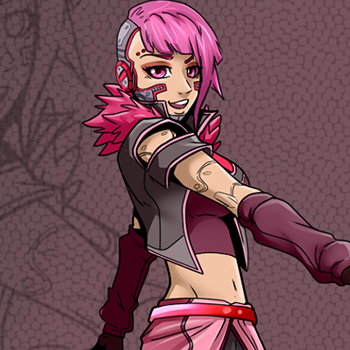 She is as bubbly as her bubblegum pink armor plating makes her out to be, constantly having fun while saving the day. As she is still learning more and more about the world, she bears a unique childishly adult perspective on life with her mind split between her true mental age and the computer side of her brain. Sometimes she seems distracted and joking, and on other occasions she can be quite reflective and philosophical. She is always encouraging, however, and selfless in her duties and will always give someone a chance to turn over a new leaf. Though she doesn’t show it often, she internalizes her worry about her original creators and what their original purpose was of making an incredibly strong walking weapon. She can’t imagine the science behind her being ethical, leaving her to wonder if things had turned out differently, would she be fighting against her best friend. Cyren is the amalgamation of cutting edge technology and morally abhorrent science, a robotic woman with a lab-grown and artificially aged human brain. She was to be an ultimate weapon with the organic ingenuity of a human with the powers and precision of a robot, but her creators hadn’t accounted for the free will of a human consciousness. Despite organic data imprinting, intense combat training, and one intimidating paint job, she became an incredibly happy-go-lucky robot with a childlike wonder and demeanor. During a routine test, she wandered away from the facility and accidentally escaped the clutches of her creators. She wound up outside wandering the streets of San Ceilo, which triggered a memory wipe and self-destruct sequence. Before the wipe was complete, her subconscious brain aborted the process, but succumbed to the memory wipe which deleted all records of her developers. Cyren was found by Borealis, Paramounts daughter, at a clothing store during an unsanctioned patrol. A large fight might’ve quickly erupted if not for the fact when Borealis arrived on the scene, Cyren was hyperactively trying on various articles of clothing. It was less a robbery and more of a loose child tearing up a high-end retailer. Aside from her name, Cyren knew next to nothing about where she was or how she got there, only she was super excited to see a real store and wanted to try “window shopping” for the first time. Knowing true AIs were illegal, Borealis asked for a diagnostic to see if anything was broken. Cyren couldn’t answer, but asked if Borealis saw anything when she opened up her head and exposed her hybrid cyborg brain. After losing her lunch in the nearest bathroom, Borealis took Cyren to Valor to figure out what to do with this new cyborg. On the way to HQ, Cyren was bubbly, hyperactive, easily distracted, and utterly annoying. Borealis would be happy to be rid of her after passing responsibility to her dad and his friends and accepting whatever punishment they had for her sneaking away. After getting to know her, Paramount determined Cyren wasn’t an immediate threat and decided it would be Borealis’s responsibility to help Cyren’s discover her capabilities. With the two girls occupied, the only question remaining was to determine Cyren’s personhood. A team of neurologists, cognitive scientists, and cyberneticists theorized it was a stolen brain, but couldn’t explain the level of integration without severely damaging the organ. It was more plausible that the organic human brain was developed alongside the cybernetic implants, which called into question who or what Cyren actually was: human or AI. Over the next few weeks, Cyren became friends with Borealis, with Borealis eventually warmed up to the idea. They were unable to determine who made her or where she came from, but they seemed to find some new ability or untapped system. Cyren was evidentially built for combat with her strength, speed, and sonic systems. Despite not remembering anything of her life before she met Borealis, her mind bore the muscle memory of her combat training, making her quick study of martial arts. After some cosmetic upgrade to reflect her lightheartedness, the pair became an inseparable crime-fighting duo, quickly dispatching various villains in San Ceilo with amazing efficiency. Together, the two developed Cyren’s humanity, establishing good guys and bad guys as well as what it means to protect and serve. Over the years, the two grew both as heroes and individuals as the next generation of Valor. However, despite her service to the city, arguments about her personhood never diminished. Despite her human brain giving rise to her unique personality and friendliness, she is for all intents and purposes, an advanced android with a partially organic brain. To this day, Cyren embodies a contention of robotic rights and the question of artificial intelligence legislation, not that she concerns herself with the debate. For now, she happily saves the day alongside her “BFF” Borealis while squeezing any fun she can have in the process. Quotes "So, people ask me sometimes where I go to recharge. When I say I plug myself in, the conversation always stops. I wonder why..." "Oh, oh oh oh! I-know-I-know-I-know! The hovercar is missing its drive core!” Moments pass “Oh, and someone stole it!" "I can do a thousand cartwheels in a row. Don’t believe me? I ran all the numbers in my head and I could handle it no problem! My brain might get a bit rumbly jumbly around 239 or so, but Mister and Missus Calculator up here don’t lie"